Strange Days' giveaway bike "The Tingler"
In August of 2011, Chris and I were attending an annual lake party in Vernon, NJ. We were floating on Lake Wallkill with brews, our friends, and feeling very optimistic after the first vintage motorcycle music campout party known as Strange Days. As we floated, we stared at the clouds and threw wild chopper ideas into the sky... upswept exhaust that resembled sun rays, girder front end with blinding chrome, a sissy bar that scraped the atmosphere and knowing of a Cb750 in town BOOM!!! A chopper meteor hit us…. The Cocaine Bandit, which turned out to be the Strange Days 2 giveaway chopper. It may sound a little comic bookish but after that weekend we started putting the puzzle together on building our first motorcycle to raffle off. It has been a great experience producing an event that has brought together the most dedicated group of vintage motorcycle maniacs on the east coast. 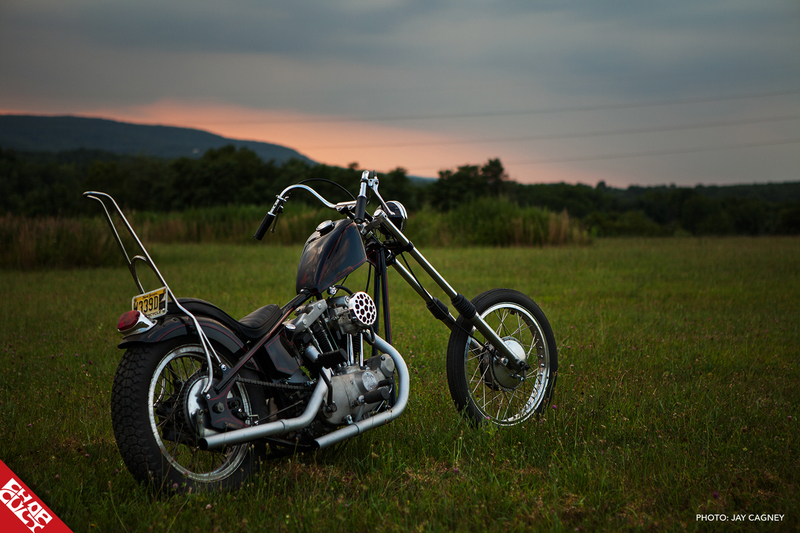 We thank you maniacs for giving us the opportunity to be creative and build motorcycles the way we think a wild road chopper should be. As fall hits NJ the gears are turning for Strange Days 5. So stay tuned for updates on the SD5 giveaway bike. In the meantime, take in The Tingler and don’t get too jealous that Kevin won this bike for $25. Hope to see you next year. 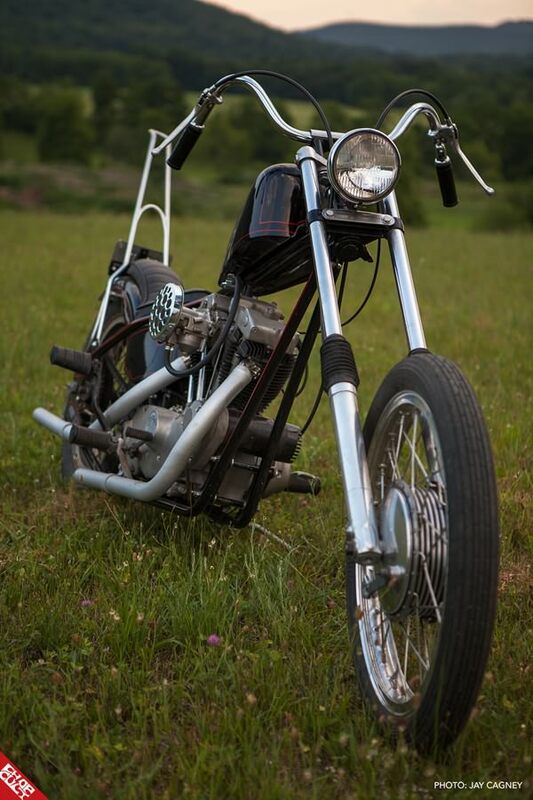 Engine, year and make, model, modifications:1971 Harley Davidson 900cc ironhead Sportster XLCH. Stock rebuilt the motor with slight modifications to OEM components, original finish work on rocker boxes, primary, cam and sprocket covers. Tire/wheel size and style: Front 21” Morad Akront rim thanks to Visionary Cycle Products, stainless Buchanan spokes tied to 71’ XL drum rolling on classic Speedmaster rubber. 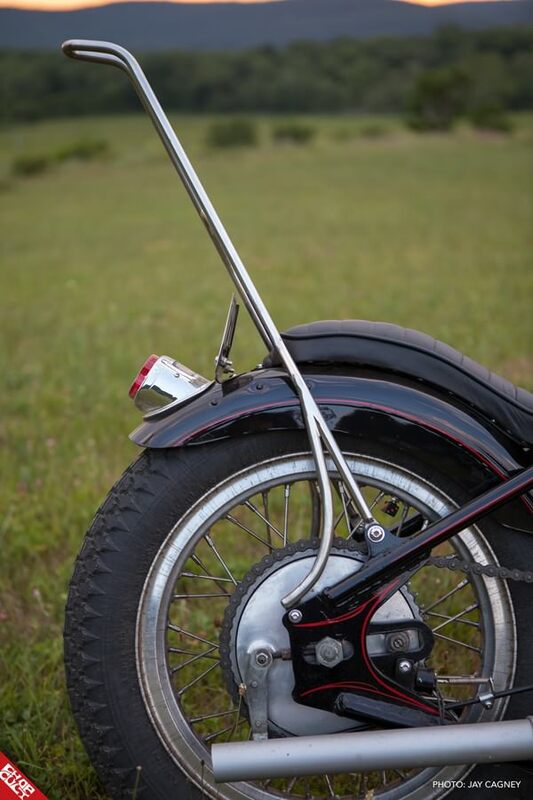 Rear: 18” HD high shoulder rim, stainless Buchanan spokes tied stock ironhead hub rolling on the super sweet Firestone ANS. Thanks to The Retrofit crew for their amazing fabrication work and overall build of the Tingler, Matt Rush for rebuilding the engine, Bob of Toon Town for paint, Carl Miller upholstery work. 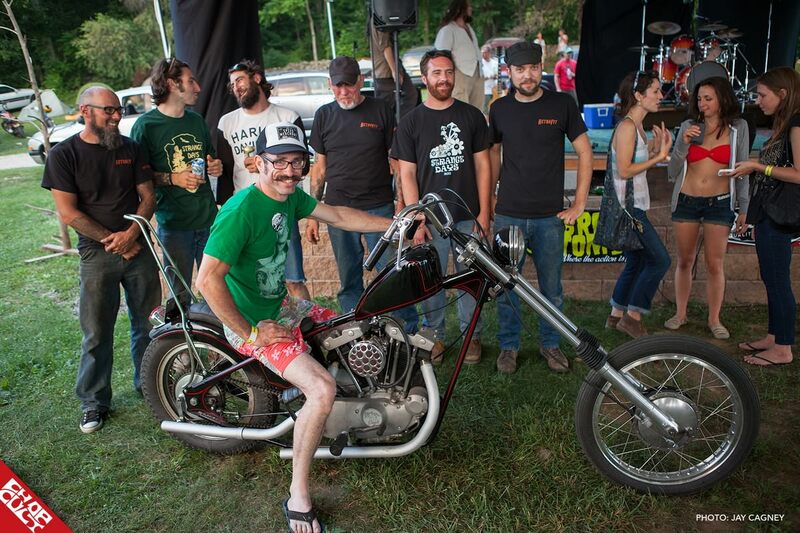 Good group of people donated their time and the personal stash of parts to build this chopper, It takes a village of crazies to raise a chopper for Strange Days!! Instagram strangedaysnj, captcalsretrofit, and, rushcyclesnj. 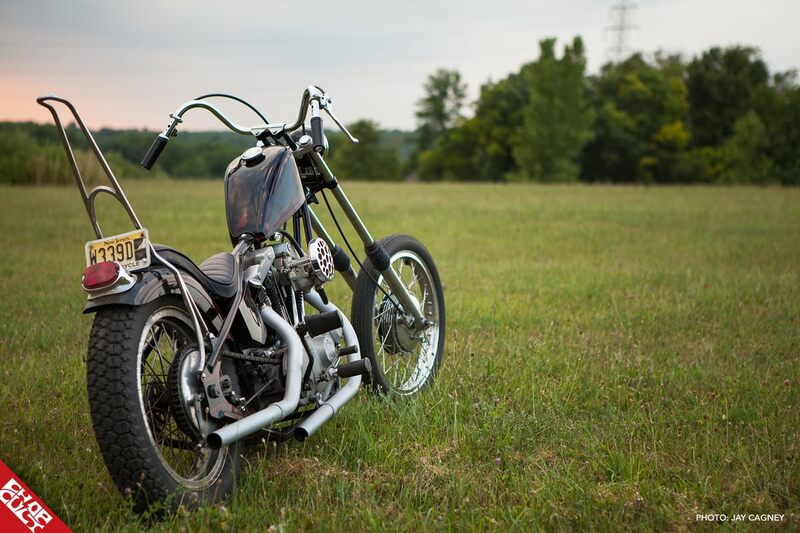 If you dig the bike above, check out the Strange Days 3 giveaway bike "Voodoo Child". Click the image below to view. I've known Kevin 15+ years or so. I'm don't even know exactly how long.But I do know that out of everyone I know, no one is more deserving to win something like this. The guy is supremely passionate about bikes and has been a regular presence on the forums here. He's been a loyal friend and for a guy younger than myself, a mentor and inspiration for the love of all things born from iron on 2 wheels. Everyone who knows him will back me. Dude is solid. This years Strange Days was my first and I had a great time with friends and meeting new heads. A real welcome having just moved to the East Coast from San Francisco this year. And whoever picked me up from almost falling in that bonfire after a few too many is also pretty solid. So thanks for that whoever you were! Killer bike, wicked weekend, rad times all around! That bike has a good look going on. Nice. great looking bike! what tail light is that? It's a stock HD taillight, on a tucked and trimmed stock Sportster fender. I was there and I must say that Kevins shorts were even more rad in person than they appear in the pictures. 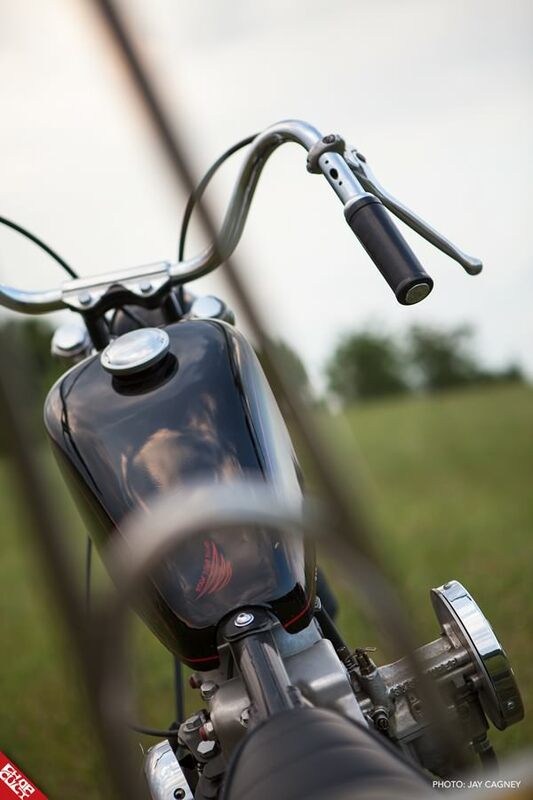 Great scoot and fantastic photography!